Adding comments takes collaboration to a whole other level. Premium users can add comments to a document. Highlight some text that you wish to apply a comment to, and the context menu shows an Add comment option. Tap the option and a comment box appears to the right of the workspace. Tap in the text field to add comments. 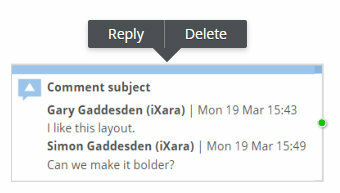 Tap the box itself to bring up a context menu with a Reply or Delete option. The comment remains locked to the text and you can drag it around wherever you like. You can resize, as well as changing color, font size and all the usual attributes through the Properties panel. Tap the speech bubble to minimize the comment box. Collaborators sharing the document can easily see which comment applies to which text - as you select a comment so the comment text subject appears in a bolder highlight. You can also add a comment box as a stand alone item - maybe you want to add a comment without it being hooked up to a piece of text. In this case just tap on the + (Add) button and then the Comment icon from the Insert panel.